When I moved into my house, as many of you know, it needed, and still does need lots of work doing to is. Everything down from the light fittings to skirting boards, window ledges, and doors needed and need to be replaced. Everywhere needs plastering, everywhere needs redecorating, and everywhere needs new flooring. After living here for a little over 10 months, I've realised that Rome wasn't built in a day, and no I can't get the dream house I've wanted, as quickly as I thought was possible. 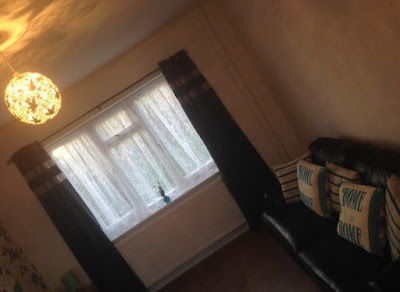 However, until I've got the money to make this house a home, I've decided to do the best that I can, and start by transforming the house, room by room, one step at a time! In just three simple steps, here's my guide on transforming a room! 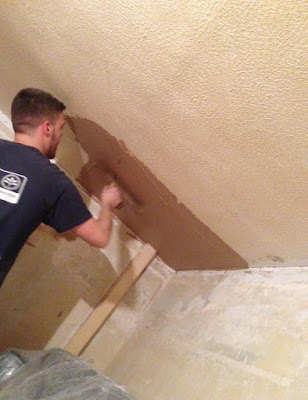 My brother Jamie offered to plaster. Step One: Accept any help you're offered and ask for help. Calling my nan one day, I couldn't quite get myself round to asking for help, instead I just moaned about how much I've got to do, and dropped in hints whenever I could. Eventually, my nan said ''do you need help Jade!? '', I quickly replied yes and was grateful for her offering. My nan then went on to tell me a wise piece of information - if you don't ask for help, no one will know you need it, and so I've stuck by that ever since, and now ask for help whenever I need it. 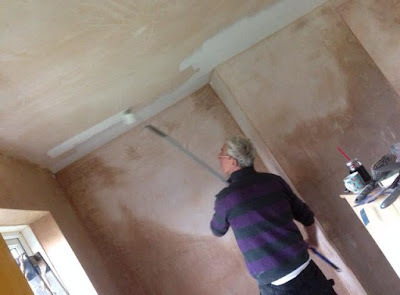 I also accept any help I'm offered, like when my brother Jamie asked if I wanted him to plaster my front room for me! My dad painting for me! Step Two: Paint don't decorate. Adding a new lick of paint to walls can make such a big difference and I've come to learn that myself. Not being able to stand the sight of the rooms anymore, I made a quick decision to paint the walls just for the meantime until I can afford to get the plastering and decoration done to my requirement. Wall paint comes in a variety of styles and colours, and is the quickest and easiest way to transform a room, whilst giving a room a new lease of life! Adding cushions and a lampshade improved the room so much! If you can't afford to get the decorators in to wallpaper your walls, keep your walls plain, use one colour for all four of them, and then accessorise the room with accessories. You can purchase accessories for a lot cheaper than you think, check out local buy and sell sights, bargain stores and even charity shops! You'll be surprised at what you can pick up for just a few pounds, and you'll be even more surprised at how they can make such a big difference to a room! That's my three simple steps on how to transform a room, to break it down; accept and ask for help, paint the walls only and accessories to brighten and lively up a room! We can't grow money on tree's, but we can save for the dream homes and rooms we'd like. Stop staring at the decorations you hate so much and make a small difference to change your mood! It helps, believe me! P.S: Dulux currently have a competition running here, where one lucky person will win a trip to Barcelona! Seeing as it's competition month on Unique Young Mum, I'd thought I'd share with all my readers and visitors! Good luck!